Trees have to be skirted to prevent fruit from lying on the ground. Mango production is not traditionally associated with the Western Cape. Notwithstanding, the region between Citrusdal and Clanwilliam has become an important late-season supplier of fresh mangoes in South Africa. Jan Smit was one of the first farmers in the region to experiment with mangoes. In the early 1980s, he and two fellow farmers planted 3ha to different mango varieties on his farm, Klawervlei, to evaluate the feasibility of production and identify the varieties most suited to their conditions. “My father and his friends most probably got the idea when they noticed how mango trees were thriving in household gardens in Citrusdal and Clanwilliam,” says Jan’s son, Danie. Production was taken to a new level when Danie joined the farm in 1998. “At that point, mangoes were treated as a sideline and sold informally from the farm, while citrus production received all the attention. I wanted to diversify our market risks and expand our labour season. Mangoes were a great option, as picking here starts in February, when production in the north comes to an end, and it ends in May, about a week before we start picking citrus,” he says. Bernie van den Heever, co-owner of Cape Mangoes, is another farmer investing in mango production in the region. Bernie became fascinated with the idea of producing mangoes in the Western Cape after seeing photographs of mango orchards in Chile and Peru, while he was working as an irrigation designer at Westfalia in the Lowveld. 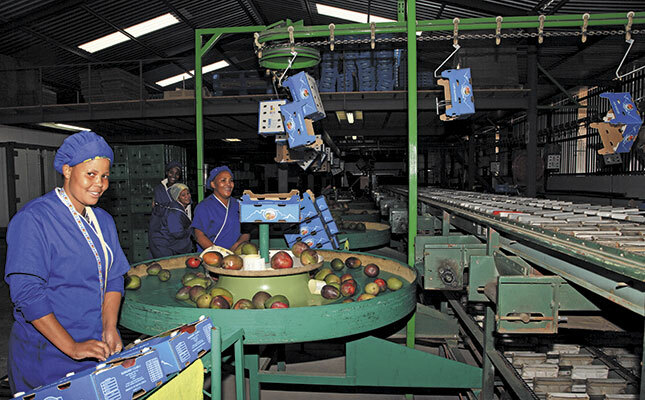 Ntombekaya Tyhokolo, Nosabelo Chambo, Fredeline Ruiters and Sinaye Zweni packing fruit at Cape Mangoes. Bernie’s search for a suitable mango-growing area in the Western Cape started in 1997, and stretched all the way from Koekenaap to Swellendam. The ideal area had to be frost-free and receive sufficient heat units in winter for good fruit set. In 2005 he finally found a suitable piece of land between Algeria, Citrusdal and Clanwilliam. The land was unplanted, and Bernie entered into a joint venture with the landowners. Bernie offered to finance the establishment and production of mangoes in return for access to the land. The owners agreed. Today the farm has 66ha under production, making it the largest mango farm in the Western Cape. According to Danie, one of the greatest challenges in establishing a mango orchard in the Western Cape was the absence of regional-specific experience and literature. “We initially tried to focus on what would be the most suitable cultivar for production here, but later realised that market demand was an equally important consideration,” Danie says. As such, while mango trees may last a lifetime, Danie has reworked most of the old varieties in his father’s trial orchard by grafting more suitable varieties onto the old rootstocks. For example, he has replaced Sensation with Keitt as the former tends to develop jelly seed, an internal disorder that negatively affects the marketability of the fruit. Today, Klawervlei has 22ha planted to mango trees, with the main varieties including Heidi, Keitt, Chené and Joa. The varieties planted at Cape Mangoes include Kent, Joa, Heidi, Sensation and Keitt, as well as a new variety that Bernie named Tropica. “Somebody told me about an unusual mango growing in a garden in Clanwilliam. I acquired plant breeder’s rights for the variety after the Agricultural Research Council confirmed it was a new variety. We think that Tropica might have developed from a natural crossing of Heidi and Sensation. If so, it has developed the best traits of both parents. It doesn’t have the internal quality problems that Sensation has, and its skin is not as sensitive to sunburn as Heidi’s. It also produces good-sized fruit, unlike Sensation, which produces many small fruit unless it’s pruned rather intensively,” Bernie says. As a result of its cold winters, the region suffers less from pests and diseases than South Africa’s northern production regions. “Our biggest pest concern is the fruit fly, which we manage through a preventative spraying programme in combination with good orchard sanitation practices, which entail removing damaged fruit from the orchards,” Danie says. However, the region has been struck by apical necrosis, a bacterial disease that farmers in the country’s traditional mango-producing regions have not experienced. The disease is caused by the phytopathogenic bacterium Pseudomonas syringae, and has been linked to Mediterranean-like climatic conditions. “The disease causes trees to die back when soil temperatures drop below 10°C. Trees usually recover on their own once temperatures rise again, but we’ve lost a few young trees to the disease,” Bernie explains. Cape Mangoes practises biological farming methods, which help boost soil health and improve the resilience of trees, says Bernie. This includes the use of compost teas made from ingredients sourced from Ecosoil and vermicompost, and balancing soil nutrients. The compost is produced in static heaps over a three-month period. Ingredients, which are sourced from the region, typically include grape skins, citrus peels, mango seeds and skins, invasive tree material, green material, cattle manure, clay, gypsum and lime. “We turn the compost up to three times to lower the temperature, and also ensure that it doesn’t become too wet so that anaerobic conditions start developing,” he says. About 500m2 of compost is made every year and applied at a rate of 10m2/ha. The compost is strewn underneath the trees by a spreader customised to also apply wood chips, which are used as mulch. According to Bernie, the condition of the soil was very poor when he initially began production, but the carbon content had improved from 0,05% to 0,5% since he began incorporating biological farming methods. With summer temperatures sometimes reaching above 45°C in summer, sunburn is another challenge that has resulted in the farmers losing up to 25% of their fruit. Bernie uses shade nets, which filter out direct sunlight, to address this problem. As the temperature under the nets is milder than the outside temperature, the nets may also assist in managing apical necrosis. So far, 40ha of Cape Mangoes’ 66ha have been put under nets. It is an expensive exercise, however, with nets costing about R180 000/ha when farm labour is used to install them. Bernie experimented with nets of various colours, but eventually had one designed that contained 25% blue, 25% white and 50% black fibres. “The nets appear blue and in effect blend better with the landscape than white ones,” he says. A space of about 1m is created between the trees and nets to allow bees to move freely underneath the structure, while trees can grow up to 3,5m tall. Bernie treats his mango trees as he would citrus trees: trees are skirted just after harvest to prevent fruit from hanging on the ground, and are pruned to ensure good air movement and light penetration. To avoid overly heavy yields, one fruit per truss is left unpicked. Extremely heavy yields leave the trees without reserves for the next season. The trees usually start to produce commercial yields from the fourth year after planting, and farmers typically break even at around the eighth year. Mango farmers from Citrusdal and Clanwilliam supply the domestic market when there is little competition, which gives them a significant advantage. Most of Danie’s mangoes are sold at fresh markets, while most of Cape Mangoes’ fruit are sold to major retailers. Danie and Bernie also produce dried mango. Initially, they dried mangoes in the sun. However, the risk of sun-drying was too high as it took up to four days to complete, and there was always the danger of rain causing losses. Cape Mangoes has thus built its own drying, pulping and juicing facility, which uses 100kVA sun panels, hydro-cooling and wood gasification to save on electricity costs. Danie rents a small dryer during the season; this has the capacity to dry 300kg of wet fruit in only eight hours. Email Bernie van den Heever at bernie@capemango.co.za, or Danie Smit at klawervleismit1@gmail.com.